Personality Mistypes - Are You an ISTJ or an ISTP? One of the most common mistypes in the typology world is the ISTP or ISTJ mistype. I’ve met many ISTPs who consistently get ISTJ results on personality tests. 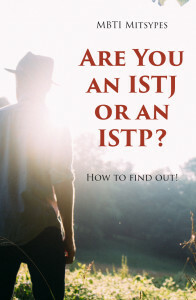 ISTPs are often mistyped as ISTJs or vice versa. There are a lot of reasons for this, but one of the main reasons is that ISTPs have a dominant judging function, introverted thinking. This is an internalized function, so the outside world may not see it very often, but ISTPs are very aware of it themselves. So when taking the Myers-Briggs test, ISTPs will often answer in a more ‘judger’ fashion than the test is expecting and they will get placed in the ISTJ category. This is yet another reason why I try to discourage people from taking the test result too seriously. How should I figure out my type then? The tests (especially the free online tests) tend to focus primarily on binary choices (are you a feeler or thinker? sensor or intuitive?) without taking into consideration the cognitive functions themselves – do you use extraverted or introverted feeling? Are you an extraverted sensor or an introverted sensor? A- Study Jung’s cognitive functions and determine which ones you use. C – Talk to a certified MBTI® practitioner. D – Take the free online test, read profiles of that type to see if they match up, and then read profiles of similar types to see if one seems to ‘fit’ you better. Okay, so back to the topic at hand. ISTP or ISTJ – that is the question! How do you figure out which one you are? Well, as always, let’s take a look at their cognitive functions. Notice anything unusual? These two types – while they are both introverts, sensors, and thinkers, share ZERO cognitive functions. I’ve seen people say “I drift between ISTJ/P depending on my mood” – well, if you know your cognitive functions, you know that can’t be true. You’d have to completely reverse all your functions to do that. 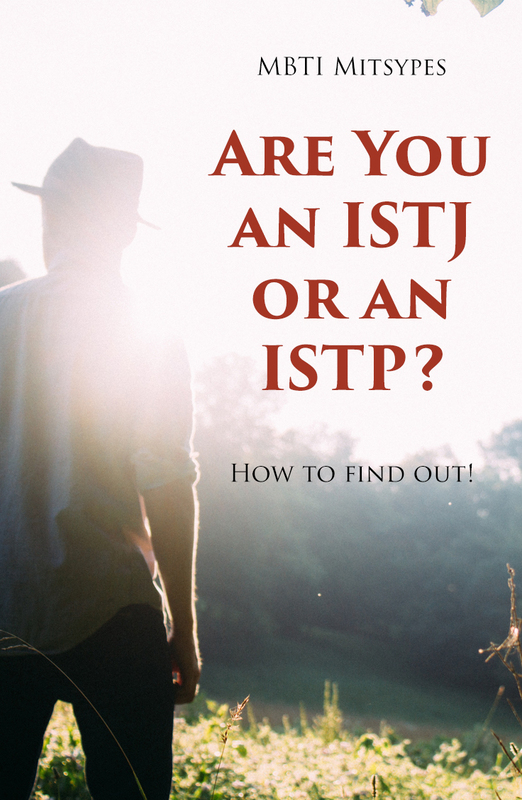 ISTPs and ISTJs are actually more dissimilar than they would appear at first glance. ISTPs fall into the MBTI category of Artisan. MBTI expert and psychologist David Kiersey calls them the “Tactical Crafters”. They are often masters of tools, weapons, or machinery, and they are usually incredibly skilled at building and constructing. They live in the here and now and are often spontaneous and adaptable. SPs are optimists who try to make the best of the current situation without getting caught up in the past or worried about the future. ISTPs live impulsively, thrive in hands-on occupations, and are excellent at solving problems or helping in a crisis. ISTJs fall into the MBTI category of Guardian. David Kiersey calls them the “Inspectors”. These highly responsible individuals usually have an incredible memory of the past, due to their dominant introverted sensing (Si). They have storehouses of information locked inside their minds, and they are excellent at using this information to solve a problem. They are very practical and don’t like to be showy or effusive. They consider the past an excellent teacher for the future, and often seek the wisdom of the men (or women) who came before them as they go forward into the future. SJ types tend to be down to earth, good at getting jobs done, and highly logical. I put this chart together (above) to show some of the more stereotypical differences between these types. Sure, ISTJs are capable of focusing on the present and ISTPs are capable of learning from the past – but each has a tendency to favor one over the other, and it comes down to the cognitive functions. We’re going to talk a little about each types most dominant functions here, to get an idea of the differences. 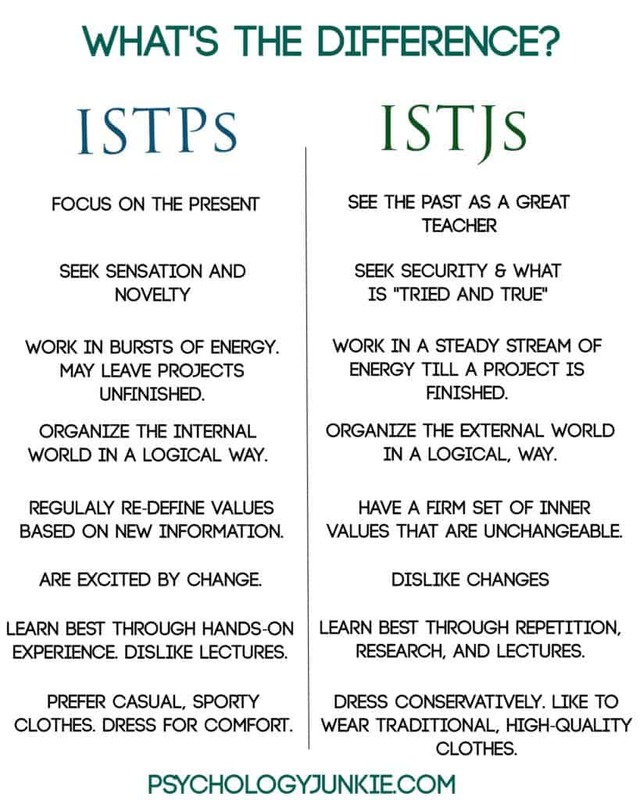 ISTPs use introverted thinking while ISTJs use extraverted thinking. Because of this, ISTPs keep their dominant decision-making process (thinking) internalized, while ISTJs keep their decision-making process (thinking) externalized. How does this show itself? Although quiet and private in nature, the ISTJ may think through their decisions out loud or organize their decisions externally. They like to take notes and look at books or manuals. They may have to-do lists or white boards with their plans listed in order. They are concerned with organizing their outer world and are usually good at delegating to get a job done. Once they have learned a solution, they don’t like to mess with it. If it ain’t broke, don’t fix it! They will then move on to the next project. They are extremely organized externally. ISTPs have an internal decision-making process, so the outside world will rarely know what is going on inside the ISTPs mind when they make a decision about something. They don’t think through their choices out loud, and they are constantly re-defining a process or plan based on new information. They don’t particularly like delegating and prefer to work alone in their own experimental, hands-on way. They enjoy finding out the principle behind something, and taking things completely apart to understand how they work. They are less focused on completing a project, then understanding how the thing works completely before getting started. They are extremely organized internally. ISTJs use Introverted Sensing (Si). This gives them a great awareness of their inner body (for example, sensations such as hunger or illness). This also makes them extremely aware of details and facts. They will often look back at past memories, studies, and research to make a decision. Si-users love traditions, which is why they are called the Guardians – without Guardians a lot of our traditions and sense of history would be gone. ISTJs preserve the past, enjoy routine, can be nostalgic, and enjoy the familiar, simple pleasures of life. They focus on the past as a way of moving forward into a better future. ISTPs use Extraverted Sensing (Se). This gives them a great awareness of their present surroundings, and how to use their body in the outside world. Because of this, Se-users are often good at sports, dancing, or physical activity. ISTPs use Se to seek sensation in the outside world. They love to live an adventurous life, take in lots of new, sensory experiences. ISTPs live life “on the edge” and like to test their physical limits. They live completely in the moment and are very adaptable. They think quickly in a crisis and are excellent at coming up with efficient ways to solve a problem in an emergency, even without any detailed information in front of them. They focus less on the past, worry less about the future, and are generally optimists. One of the best ways to really understand your type and make sure you are typed correctly is to figure out how you react to stress. ISTPs and ISTJs react to stress very differently. ISTJs when first experiencing stress tend to feel tired and overwhelmed. They may try to solve a problem by first using introverted sensing. They will try to focus on the details and data of the situation that is causing them stress, and figure out what has worked in the past to solve it. In their efforts to solve the problem, they may come off to others as irritable, inflexible, or impatient. If stress increases, the ISTJ may wear out their dominant function and fall “into the grip” of their inferior function; extraverted intuition. This is when the ISTJ goes into “catastrophe mode” and can see nothing but the potential of what could go wrong. They can become overwhelmed and depressed about what they see as a bleak future, embracing an overwhelming fear of what is to come. ISTJs are not a very stressed out type compared to most. They usually fall into the lower to medium stress category. This isn’t to say you can’t be stressed out if you’re an ISTJ, or experiencing chronic, high stress. On average, though, ISTJs tend to experience less stress than many other types. You can find out more about ISTJs stress reactions (and how to help) here. ISTPs are very private about what stresses them out. When they first experience stress, they’ll try to “fix” the problem through a logical solution, using introverted thinking. If the problem continues, and it can’t be fixed, they may wear out their dominant function and fall “into the grip” of their inferior function – extraverted feeling. When this happens, they may become uncharacteristically emotional, hypersensitive about their relationships, and may misinterpret small, insignificant details as signs that others dislike or hate them. ISTPs have low stress compared to most other types. Because of their tendency to be optimistic and make the best of the present moment, they are often able to manage their stress quickly. However, every person is different and there are definitely exceptions to this “rule”. An ISTP in a lifestyle that doesn’t suit his or her strengths can be incredibly stressed out on a regular basis. You can find out more about ISTPs stress reactions (and how to help) here. ISTPs and ISTJs have a lot of characteristics that make them unique from each other. Both are incredible personalities and a lot of fun to be around. I’ve been a member of several ISTP and ISTJ groups on the internet, and they are some of the most entertaining, humorous groups of people I’ve come into contact with. I love how down to earth both types are. My hope is that they will feel I didn’t let them down with my analysis of their differences! Let me know if you have any thoughts or comments! This article is pretty accurate. I’m an ISTP, and my husband is an ISTJ.. and we think nothing alike. His Te likes to discuss everything out loud… and I have to process it all internally before I can share what I’m thinking. I guess after living with him, I have a hard time imagining mixing up the two types cause they’re so drastically different in my mind.